The sampSurf package can be used to construct sampling surface simulations for different areal sampling methods common to forestry and ecology. Areal sampling methods in general would include fixed-area plot methods, line intersect sampling, and various variable-radius plot sampling methods, the latter more commonly used in forestry. Most of these fall under the general probability proportional to size (pps) umbrella and have some form of inclusion zone associated with each individual in the population. The inclusion zone has well-defined area (sometimes called the inclusion area) and may be thought of simply as that zone within which a sample point could fall and select the associated individual. The sample point can be the center of a circular fixed-area plot, an actual point as in horizontal point sampling, or say, the midpoint of a line in line intersect sampling. In general we are interested in determining the properties of various sampling methods mentioned above when applied to fixed objects such as standing trees or down logs. The sampSurf package will allow generation of log or tree populations within a fixed tract area. 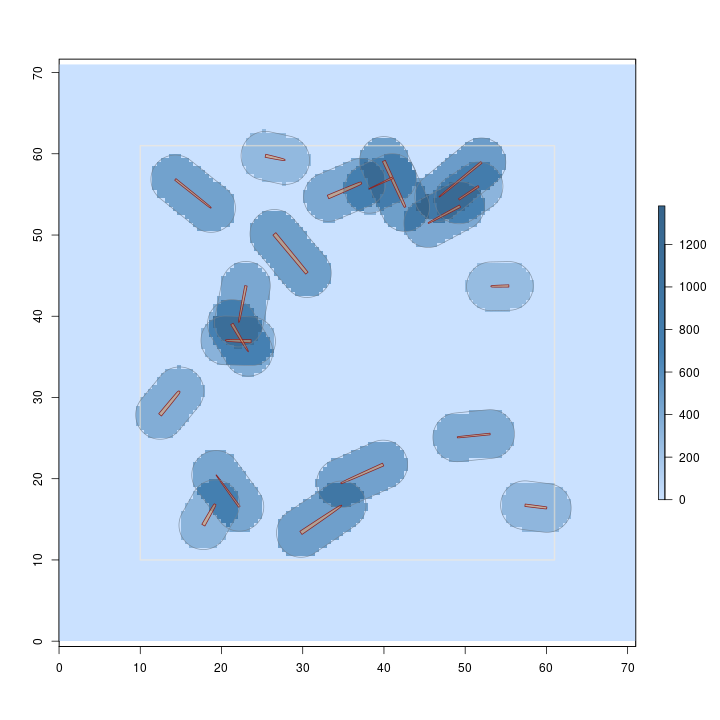 The surface generated from the intersection of inclusion zones applied to the individuals in the population for a given attribute (e.g., volume, number of individuals, etc.) are represented by the "sampSurf" class and can be displayed graphically. 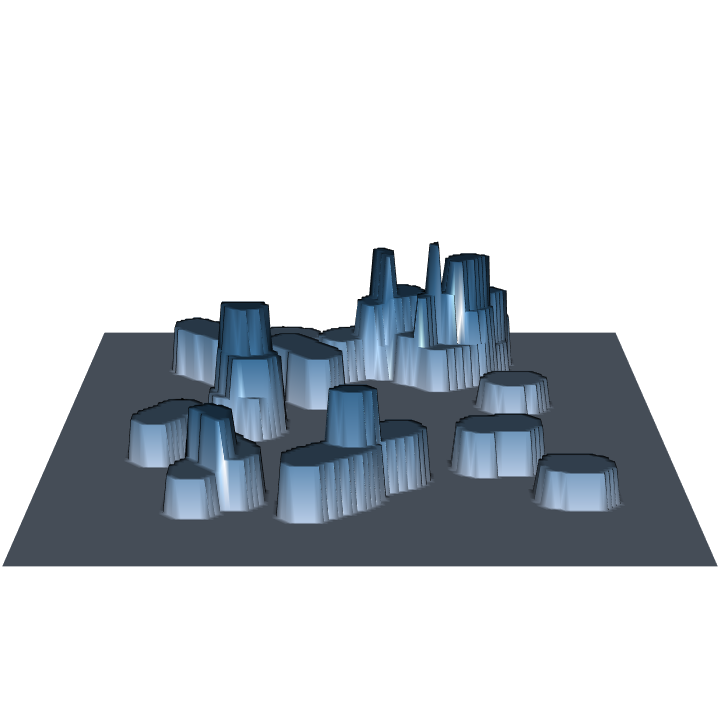 Estimator variance is directly associated with the sampling surface roughness, and so methods can also be compared visually. There are several vignettes associated with the package that provide detailed explanation and examples of the design and use of the various components. A good place to start is with The sampSurf Package Overview vignette, which provides an overview of the class structure, etc. The vignettes are all available from the package index help page once the package has been installed and loaded using library(). Another overview of the package in the help system can be found by issuing package?sampSurf at the R command line. This help page will provide links to all of the built-in class structure, generics with associated methods, and helper functions. Running the examples (with R's example() command) will also provide some help in getting started. 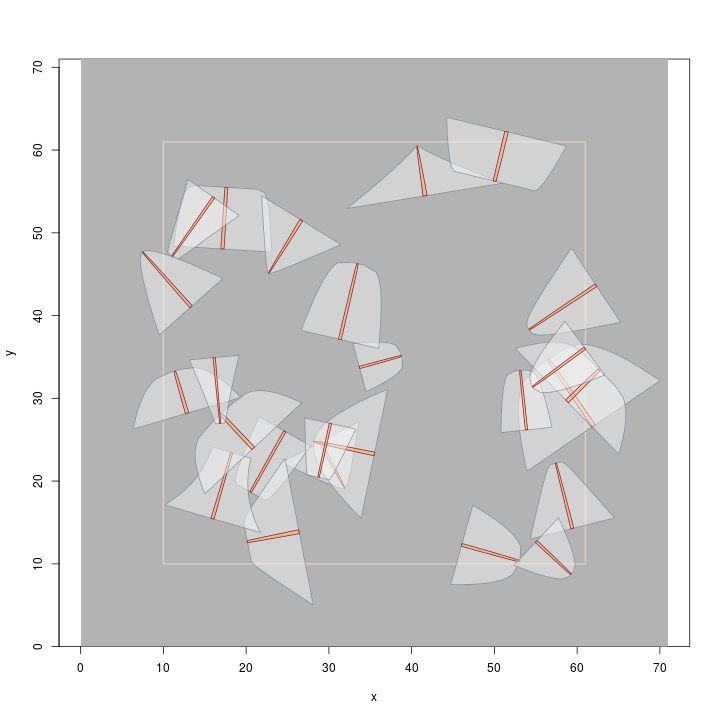 A recent addition to the package (in version 0.7-0) is the ability to sample down logs or standing trees for volume using Monte Carlo methods. These include crude Monte Carlo, importance sampling, control variate sampling, and antithetic versions of each. 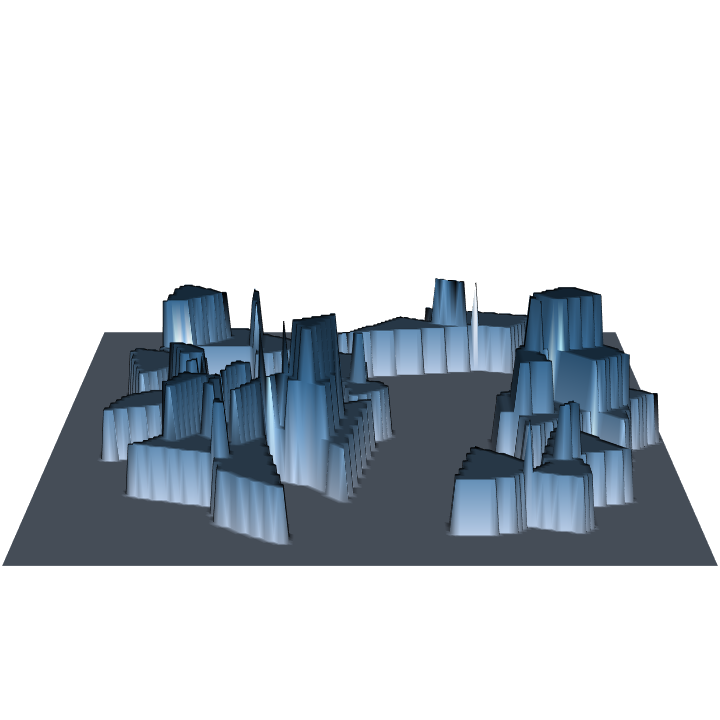 These are not areal methods, and apply directly to the stem objects themselves, so stem-based simulations can be conducted independently of an areal method. However, they can also be added to any areal method for a two-stage approach. 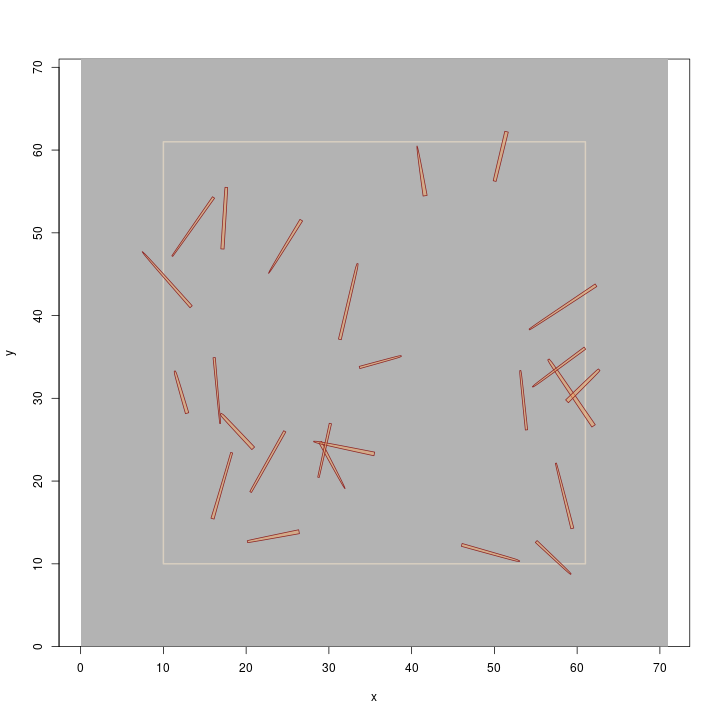 For example, this has been incorporated in horizontal point sampling for standing trees. Furthermore, as of version 0.7-2, the mirage method is available in addition to buffering for correction of boundary slopover. As in the buffer method, mirage correction is accomplished by running a simulation on a special mirage Tract subclass object. That is, for buffering, a bufferedTract is used, whereas for mirage, a mirageTract is used. For more information on how each of these sampling and boundary correction methods is implemented within sampSurf please see package?sampSurf and the vignettes. The examples below also provide an illustration of some of these methods. sampSurf is now on CRAN. It is probably best to install it from there as the version here at R-Forge might not always be fully functional. However, if you do desire to use the version here, please read what follows as it may help. The above should do it, while getting the correct stable releases from CRAN prior to installing sampSurf (again, it's probably best to install the CRAN version of sampSurf too). Please note that as of sampSurf version 0.6-6 (26-Nov-2012), rgeos has replaced gpclib due to the limited use license restriction on the latter (see this package on CRAN). Please see the instructions for installing rgeos if any problems arise. That should do it on Linux, I have not tested this on other platforms, but it probably will work. Now when you do something like package?sampSurf at the R command line, you will get the response in your browser with hyper links to other useful pages. On Linux, the rgl package requires system dependencies. The freeglut and mesa libraries must be installed. But in addition, the development versions of freeglut and libpng must also be install for rgl to run. On Fedora, these are freeglut-devel and libpng-devel which could be installed with yum prior to installing rgl within R. If you use windows or OS X, unfortunately I can not be of any help (but please let me know so I can post instructions here for others if there is anything extra one has to do to get rgl working on those systems). monte: When is n Sufficiently Large? Perhaps the most helpful introduction to sampSurf is found in the first vignette listed above. It provides more detail using extensive examples, on the organization, capabilites use of sampSurf. Here we present some very simple examples illustrating how to use a few of the main functions in the sampSurf package. The vignettes go into extensive detail concerning the use of the methods shown below. In addition, the online help system is quite thorough in documenting class structures, generic functions, and their methods. Therefore, we have provided just a very terse set of examples to show a little of the functionality of the package here. In general, there are two main ways to create a sampling surface: (1) simple, usually "one-off" construction, or (2) progressive, by constructing intermediate elements that can be re-used for comparison of methods, etc. Both will be demonstrated below. The first example shows how to create a sampling surface "on-the-fly," as it were, by hiding the intermediate steps used in building the surface. The only exception is that we always need some form of Tract object to be created ahead of time with the desired extents and resolution. This method is simple, but it does not easily allow for reuse of elements (e.g., the stem population, though it can be extracted if desired for reuse) in comparing other attribute surfaces, or different sampling methods. In the above example, we have first made a Tract object in metric (SI) units with no buffer that is one half hectare in area (71x71m), and has a grid resolution of 0.5m. The second step creates a buffered version with a 10m internal buffer. The two steps could, of course, be combined into one, but they are separated here for clarity. The internal buffer is generally set large enough that no inclusion zones will overlap the outer tract boundary; thus, eliminating concern for boundary slopover issues. Notice that you can specify the default log dimensions (e.g., buttDiams for the range in large-end log diameters) that will be used in creating the synthetic log population for this simulation. The plotRadius argument specifies the radius of the sausage-shaped inclusion zone to be associated with each log. 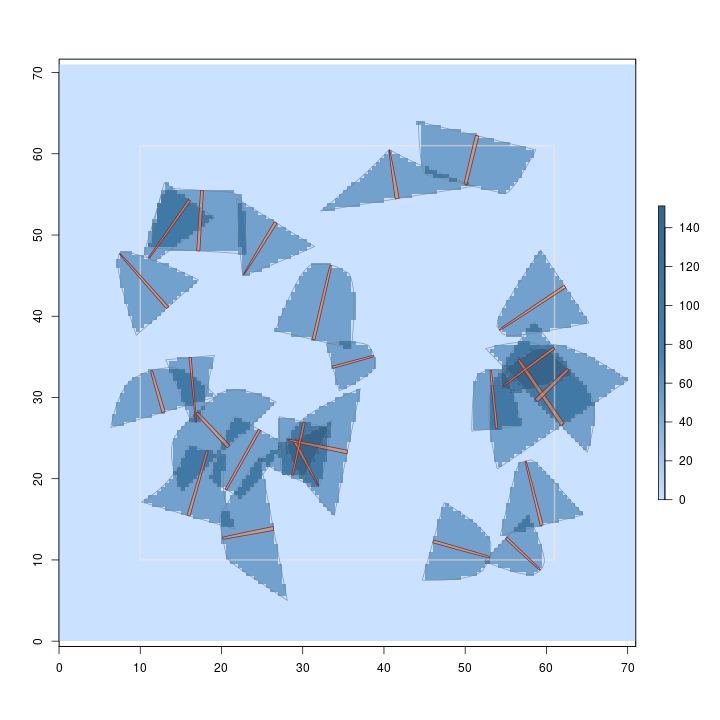 The plot function shows a two-dimensional display of the sampling surface, with down logs plotted by default. The logs are created so that their midpoints (both longitudinal and radial) fall within the internal buffer of the bufferedTract object. Choosing a plot radius that keeps all of the inclusion zones within the tract for the longest possible log will ensure that all inclusion zones fit within the tract, eliminating boundary slopover issues. The constructor will warn you if any inclusion zones overlap the tract boundary. Printing the object in the first line, displays the specification on the internal Tract object, which derives from RasterLayer in the raster package. Using summary on the object returns information about the sampling statistics for the object. Note that sampling for log length under the sausage sampling protocol of fixed-area plot sampling yields a constant height surface for each log, which varies between logs. This method is a probability proportional to length estimation method, and normally the heights would be constant for all logs under such a design. But sausage sampling is a little different in this respect because of the way the inclusion area is determined. Create a population of synthetic stems in the form of logs or trees. If need be, create an ArealSampling object with the specifications for the method. Combine the stem population and the sampling method in the last two steps and form the population of InclusionZone objects. Create the sampling surface from the collection in the previous step. 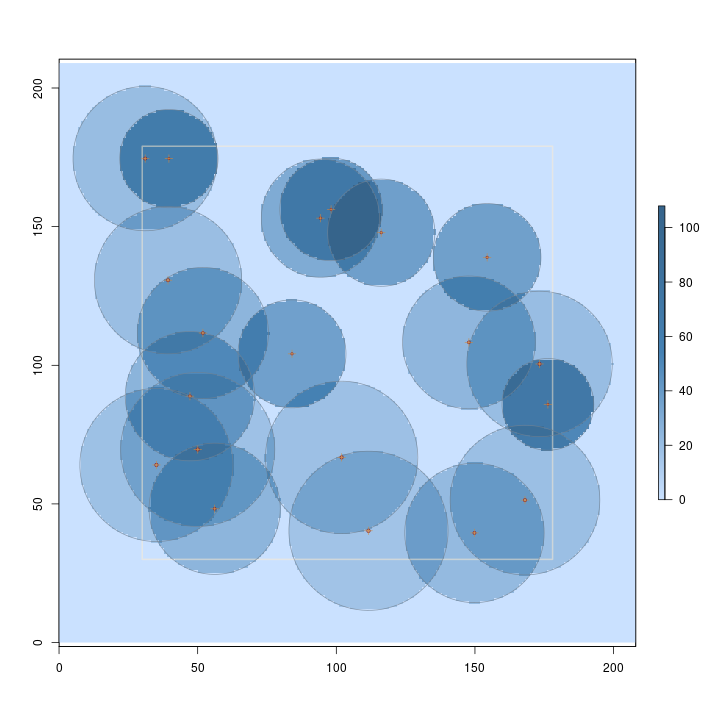 Some sampling methods or protocols do not require you to explicitly create an object that describes the sampling method in step 3; these include the fixed-area plot methods, where one simply specifies a plot radius. All other methods require information on design parameters as we will see below. We created a population of rather long, and large-diameter logs so they display nicely on the plot (remember, this is a metric example, and the buttDiams argument is in cm). The collection is created using the downLogs object constructor. The second line prints some summary information about the collection. The default is for metric units as we can see in the object summary. The associated volume, surface and coverage areas are determined for this particular Kpds factor and are also shown in the summary. I don't want to get into the structure of the package classes too much at this point, but the summary shows that the perpendicularDistance class is a subclass of ArealSampling, and the pertinent information for both classes is shown (i.e., the subclass inherits the units slot information from the superclass). With regard to the volume (surface or coverage area) factor, pds is a probability proportional to volume (surface or coverage area) sampling method, depending on which protocol is selected in the next step (where the inclusion zones are created). Therefore, each log counted on a sample point contributes, in this case, 100m3 (or 100m2) of volume (surface or coverage area) to the estimate. Min. 1st Qu. Median       Mean    3rd Qu. Max. Note that the downLogIZs constructor method creates the collection, and can work with any sampling method known to sampSurf that can be applied to sampling down logs (there's a companion method for standing trees as we will see in the next section). A summary of the collection is then printed showing some statistics on the inclusion zone areas (use hist on this object to display a histogram of the areas). Next, as a quick check to make sure all zones lie within the Tract object, the collection is plotted over the tract. Finally, we chose sampling with probability proportional to volume in this example (the pdsType argument). Therefore, the shape of the individual inclusion zones is an inflated version of each log's individual taper in terms of cross-sectional area along the stem (the integral of cross-sectional area is volume). Because we are sampling with probability proportional to volume, and estimating volume, the volume estimate for each log is the same and it gets spread evenly over its inclusion zone under pds. Also, since each log accounts for the same estimate (the volume factor), we get an even stair-step "heaping" of the surface where the inclusion zones intersect. This is the more normal case when you are sampling to estimate the "design attribute" that the method is optimized in terms of; the sausage protocol above is an exception to this rule. Note in the figures that larger trees represent fewer trees per acre, and thus have lower surface height than smaller trees. 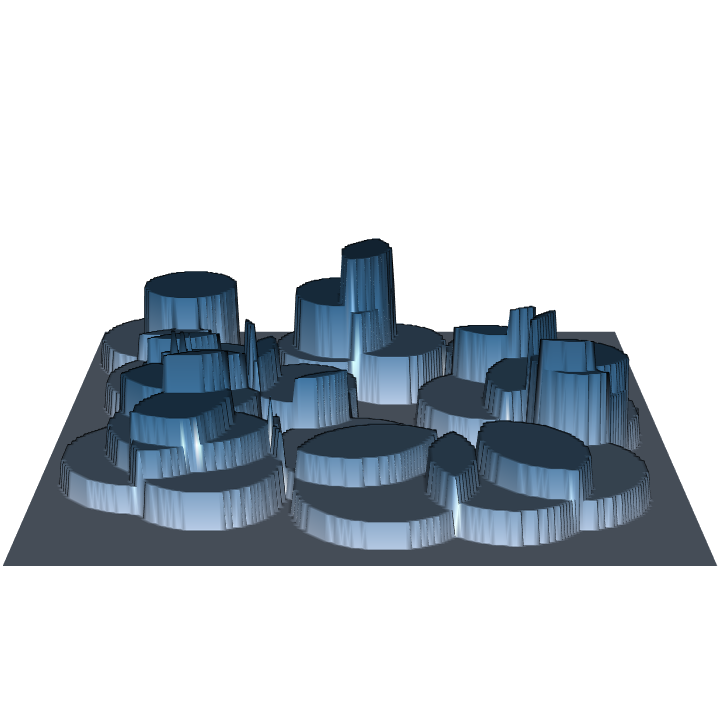 Some sampling methods (or protocols for a given method) even have variable height surfaces within individual inclusion zones for each stem, perhaps you'll stumble across these in the use of this package. The examples presented assume some knowledge of the subject area with respect to areal sampling methods. Hopefully one can get an idea of what is involved in using the package and some uses it might be put to by comparing different (or new) methods on the sample stem populations. The vignettes provide much more detail and both they and the help pages have references to some of the more recent papers on both the sampling methods and the sampling surface concept. Please let me know if you've found sampSurf useful, or find any problems. The examples in this page were generated using the very useful R package knitr.